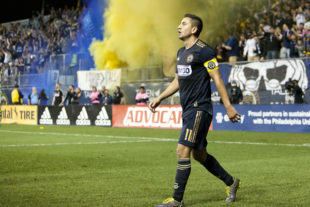 The joy hadn’t quite escaped Alejandro Bedoya’s eyes, and a smile still lingered across the face of Philadelphia Union’s captain. But the adrenaline that came with scoring a stoppage time goal in front of the River End, securing an electric come-from-behind- 2-1 victory over FC Dallas, gave way to something else. “I’m freaking dead right now,” Bedoya told the group of reporters gathered in the Union’s locker room Saturday night. The spotlight rarely shines so brightly on the midfielder as on-field excitement gives way to post-match exhaustion. Flashier storylines and GIF-worthy moments often overshadow Bedoya’s tireless contributions. Since he was acquired for a then franchise record fee from FC Nantes in Aug. 2016, his quality has been more quietly appreciated than audibly praised. His manager, Jim Curtin, was happy to laud the veteran and the importance of the goal on a personal level. This season, Curtin and Sporting Director Ernst Tanner are asking Bedoya to play his ideal role— to don his personal Cinderella slipper as the No. 8 in the Union’s 4-4-2 diamond formation. Philadelphia’s setup now maximizes one of its best player’s talent. Clichés are difficult to avoid when describing a player like Bedoya: He leaves it all on the field. He’s the engine— the heartbeat of the team. The same adjectives pop up: gritty, industrious, hard-working. They’re crutches used to describe a player who cannot be defined by metrics. But Bedoya does leave it all on the field. The team does go as he goes. He is all those descriptors repeated and regurgitated for every talented box-to-box midfielder. And he’s more than that. The U.S. international is cerebral. In defense, Bedoya can analyze the attack and recognize his side’s vulnerabilities before the danger is imminent. He shifts and adapts, not always making the crunching tackles or crucial interceptions, but rendering the threat toothless through positioning. In attack, the midfielder is more than the seven goals and 10 assists in 77 MLS games would indicate. His off the ball movement is key in creating chances, pulling defenders out of position with mazy runs meant to distract. The combination of his “industrious engine” and mental approach are why Bedoya is tailor-made for one of the game’s most demanding positions, and how he’s found success there in the first six games of the season. Bedoya played at the base of the midfield triangle in the previously preferred 4-2-3-1 setup. While the Union added an extra body to the center of the field with the incorporation of the diamond, his responsibility only increased as the shuttling No. 8 on the right side of the pitch. The coach proceeded to go over the defensive intricacies of the position in detail— how they need to read the movement of their own forwards to determine how much and which area they’ll have to cover. How communication with their back line is key in determining when to release on long, diagonal balls. If Bedoya seems like a natural so far, it might be due to his success wearing the Stars and Stripes. While the current role is the best for the midfielder, that skillset offers another defining characteristic— flexibility. He’s played as a winger, as a No. 10, as a holding midfielder, and in Saturday’s win, as a wing back in a three-man back line. “I think you should write about Bedoya being the right back of the national team in the future,” quipped Curtin, with maybe a subtle nod to his captain’s disappearance from the U.S. national team picture. Even in the No. 8, Bedoya’s role has fluctuated depending on need. He played on the left to accommodate the right-suited Ilsinho. With the more defensive Warren Creavalle opposite him, he spent more time in the attacking half. Conversely, the success of Brenden Aaronson has coincided with a more defensive approach. Wherever he plays and however he plays, Bedoya offers consistency. He’s likely the first name Curtin pencils into the team sheet each week and has been since his arrival. For all the physical stress the role can put on a 31-year-old body, it’s good to have some help at home. The Union need that trend to continue. Bedoya’s current success as the No. 8 will go hand-in-hand with Philadelphia’s ambitions this season— even if his first goal in 793 minutes came as a right back. Ale is doing a great job! I hope with the depth we have now, they find a way to get him the rest that he deserves through squad rotation so his tank isn’t empty at the end of the season for playoffs. It would be nice to have him fresh late in the season. The guy has been really good here! He’s been a great signing for us. But glue players alone won’t get you there, as Toronto found out when they signed Michael Bradley his first year. Bedoya, like Bradley, needs the proper supporting cast to maximize his abilities. Maybe we finally have that. a good player can dictate a large portion of the game simply through awareness. Never ceases to amaze me how few ‘high level’ players are aware of passing lanes and how taking them away, pretending to offer them by decoying positioning then jumping the pass can positively affect a teams outcome. Bedoya is ever mindful, to this I give him credit.